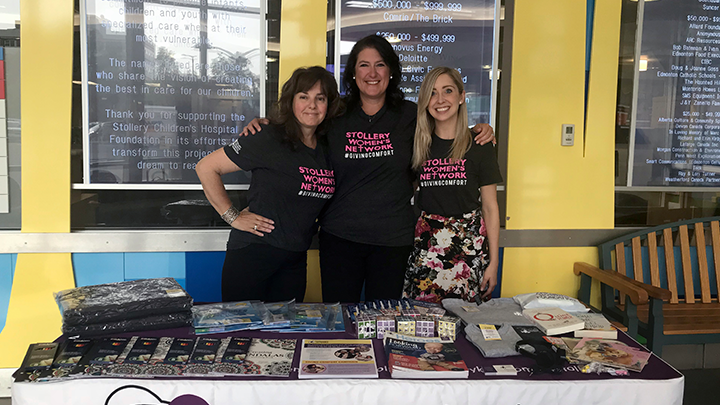 Stollery Women’s Network members, Elizabeth Leyzcynski, Michelle Devlin and Brianne Thomas giving out comfort items to patients and their families at the Stollery on Aug. 14. EDMONTON — Visiting the Emergency Department with a sick child can be a stressful experience for both the child and their family. Something as simple as a toy or blanket can improve a child’s experience, distract them from any anxiety they are feeling and help the family cope with the situation they’re facing. The Stollery Women’s Network (SWN) Giving Comfort Campaign supports these families by providing the comforts of home such as books, toys, blankets and toiletry kits, when they need it the most. According to Sharon Drury, unit manager for the pediatric emergency department at the Stollery Children’s Hospital, introducing the Giving Comfort Campaign to the emergency waiting room was a way of engaging with patients and families after the triage and registration process. “It gives us an opportunity to interact with patients, address their concerns, and help put their minds at ease during stressful situations,” she says. As a volunteer-arm of the Stollery Children’s Hospital Foundation, the SWN has raised more than $267,000 in support of the Giving Comfort Campaign and have handed out more than 3,500 comfort items since launching in December 2017. For Michelle Devlin, a longtime SWN volunteer, joining the Network was about making a difference for families. “I decided to join the SWN because I firmly believe in the work we’re doing to not only support Stollery kids, but the families that bring their kids here. It’s so meaningful to see the difference it makes on the level of care received,” she says. Devlin says the Giving Comfort Campaign is so much more than passing out toys and blankets. It is about the experience provided to patients and their families. “These may seem like insignificant items, but if you’ve been to the hospital with your child, you know that as a parent or a sibling, that there are long hours. To me, this is really about supporting the wellness of patients and families,” she adds. Brianne Thomas, program director of the SWN, says the Network is always looking for new volunteers to support the Giving Comfort Campaign. For more information about the Stollery Women’s Network, contact Brianne Thomas at Brianne.Thomas@stollerykids.ca or visit stollerywomensnetwork.ca.